Robersonville, NC – “Winning takes talent, to repeat takes character.” Louis White showed plenty of both this year at East Carolina winning a very impressive twelve times. This past Saturday marked the final event on the 2014 calendar and Louis White had all intentions on going out with a bang. White proved his dominance once again at ECMS by picking up his 12th win and doing so by leading every lap. Now a lot of people think when they read stuff like wire to wire, dominated the field, flag to flag, that it was super easy for the driver. White wouldn’t call this weekend super easy by a long shot because the team broke a transmission in a Friday evening test session. The crew had to pull the transmission out of White’s dedicated Late Model and head right back to the track Saturday. I would say the car and driver missed a beat because when it came time to qualify we saw Louis White on the top of the speed charts yet again with a 15.49 (87.153 mph) second lap time. When the green flag dropped White tried to get all he could out of the go fast pedal but she didn’t work as good as she had in the past. Five laps were in the books before the field ran into trouble down in three and four, and all five laps Allensworth and McNair were just about nose to tail with your leader. Something the orange and black car of Louis White has not seen much of this year, and that is the nose of another car in his rear view mirror. When the field went back to green flag racing Tim Allensworth had a hell of a restart and was all over the bumper of White battling for the top spot. Shelton McNair, and now Taylor Howard – mind you Howard has been amazing all year at the races I have been to but has some kind of failure or the car drops way off – running in the fourth spot chasing after the lead. Action picked up in this twenty or so lap segment with McNair knocking on the Allensworth’s door, Wesley Johnson fighting for the fifth place with Shiflett and Doug Liberman. The field saw the yellow flag for the second time of the evening for the spin of the #56 machine, Doug Liberman. 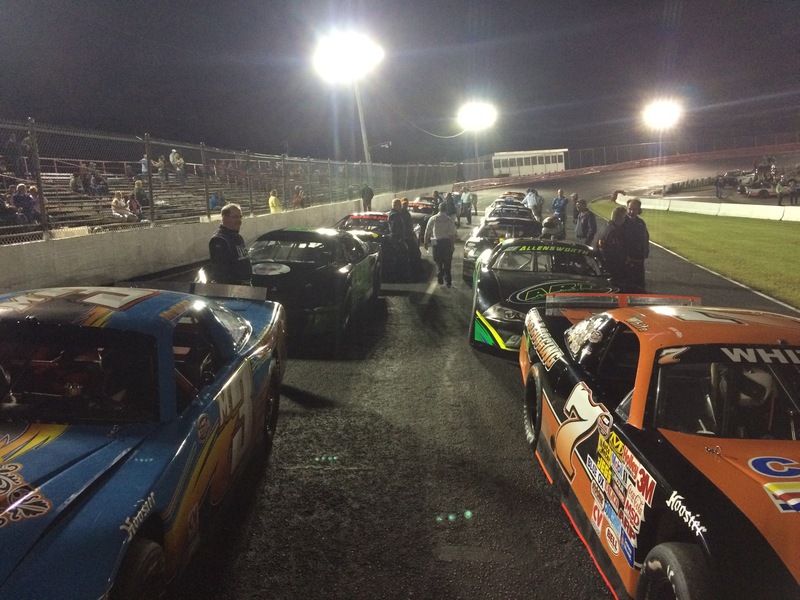 Making that last segment the longest green flag run of the night so far! We saw a couple of cars make strong runs then almost immediately fall off the pace. Shiflett & Howard being prime examples. As the field took the green flag with lap 43 on the board McNair, who grabbed the lead from Allensworth in the middle of that last green flag run, did not let White get away and would go to work side-by-side diving into turn one. You would have to credit White with lap 44 has he nudge out McNair all the while Allensworth pulls his machine to the driver door of McNair making a case as to why he should be running second, behind them Brian Whitehurst and Taylor Howard mix things up just a bit. Not sure when I was looking away these cars (Whitehurst & Howard) touched at all and maybe knocked the toe out of Howard’s car but, he was stranded to the high side, slightly off the pace, and quickly moving to the rear of the field. Either way this was not going to stall the efforts of Whitehurst who immediately went to work on the inside of Allensworth who would eventually surrender the position scoring Brian Whitehurst inside the top five with twenty laps to go. We saw our third caution for the spinning car of Gerald Benton who almost collected the machine of Ryan Haddock. From what I gathered not a whole lot of damage if any the machine, however, clean up did spend a few laps working stay dry down on the track to make sure the racing groove was safe. On the ensuing restart both White and McNair got insane jumps and left the field to deal with themselves. Oh boy did it get a little crazy! It was like driving 70 mph on the interstate and everyone slams on their breaks to let someone over from the entry ramp. Luckily everyone was able to get slowed down, might of had some contact but nothing really huge to cause any wrecks so we stayed green flag racing. With over sixty laps on the tires not to many people had anything left to muster up and cars started to get strung out which made it a pretty easy final laps for Louis White. McNair, Whitehurst, Johnson, and Shiflett are how they crossed the line to round out the top five for the final event of the Ronnie Barnette Memorial 200. 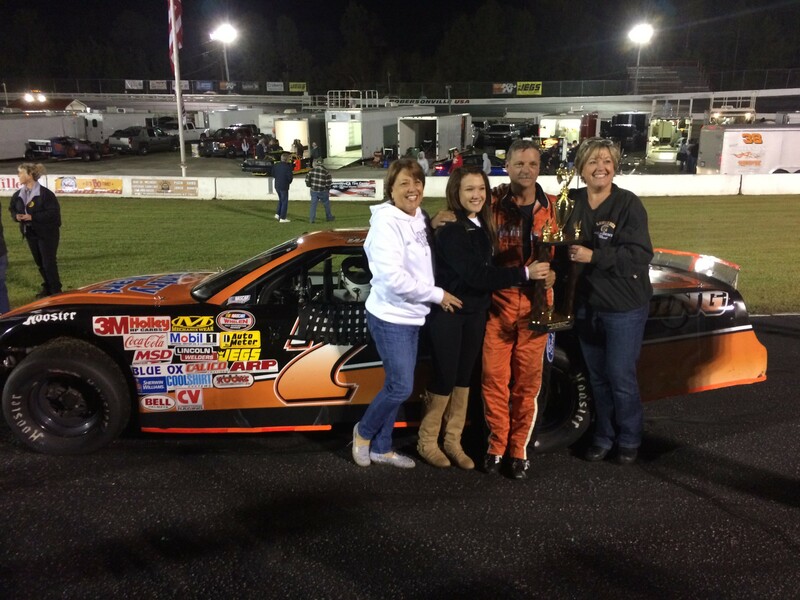 Louis White wrapped up a dominating 2014 season at East Carolina Motor Speedway not only winning the track championship but also taking home the hardware in the tracks first of what seems like to be many memorial races. We asked Louis due to his success this year will he return next year, I think if you know anything about a race car driver you should know the answer to this one. Louis White will pack things up and head to Caraway Speedway in just a few short weeks along with the likes of Bradley McCaskill to compete in the Southeastern Limited Late Model series race being held there November 1st.